It is an 8 bit CMOS technology based microcontroller belongs to the AVR family of microcontroller developed in 1996. 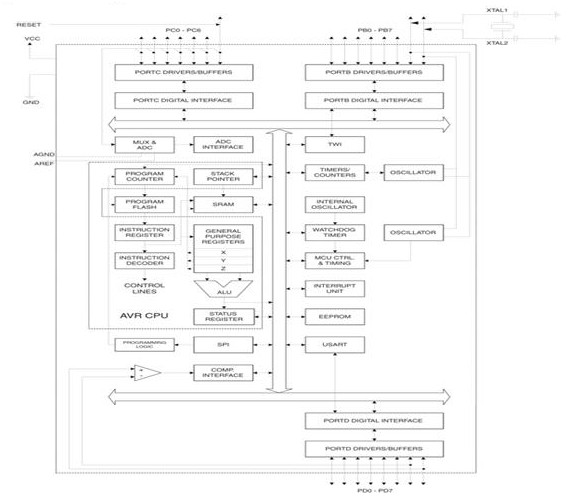 It is built on RISC (Reduced Instruction Set Computer) architecture. Their main advantage is it doesn?t contain any accumulator register and the result of any operation can be stored inside any register, defined by an instruction. ATmega8 microcontroller consists of 1KB of SRAM, 8KB of flash memory and 512 bytes of EEPROM. In ATmega8 microcontroller all the registers are connected directly with Arithmetic Logic Unit (ALU). The EEPROM memory is used for storing the user defined data. ATmega8 microcontroller consists of 3 I/O ports, named as B, C and D with a combination of 23 I/O lines. Port D consists of 8 I/O lines, Port C consists of 7 I/O lines, and Port B consists of 8 I/O lines.